ORONO, MAINE — May 9, 2017 — The Wild Blueberry School Foodservice Program, launched this year by the Wild Blueberry Commission of Maine is quickly – and literally – gaining new ground. In the last month, eight new public school systems across the U.S., including Arkansas, Florida, Michigan, Minnesota, South Carolina, Tennessee, Virginia, and Washington, have all jumped aboard and are now offering frozen Wild Blueberries to their statewide school districts. According to recent USDA Agricultural Marketing Service sales data, more Maine Wild Blueberries were sold to schools during the month of April 2017 than for the entire 2016 schoolyear. In April 2016, 435,600 pounds of Maine Wild Blueberries were sold, as compared to 1.275 million pounds sold in April 2017. Total volume sold in 2016 was 1.188 million pounds. By May 2017, total sales surpassed that amount, reaching 1.275 million pounds, according to the sales data. The boost in sales for the 2017-2018 school year is due to several factors, including a robust sales and marketing effort targeting state foodservice directors, which is partially funded through a $50,000 grant from the Maine Department of Agriculture, Conservation and Forestry; favorable new USDA yield data, which demonstrates that one pound of frozen Maine Wild Blueberries provides 25% more servings than the same weight of frozen cultivated blueberries; and strong performance of a new, smaller packaging option, which includes convenient 3-pound bags. In the coming school year, Maine Wild Blueberries can be found in public school systems in 19 states, compared to 13 states this year. “In the face of the current industry challenges of oversupply and low prices, we knew that we had to act aggressively to better position frozen Maine Wild Blueberries,” said Nancy McBrady, Executive Director of The Wild Blueberry Commission of Maine. “The USDA’s School Meal Programs, which serves breakfast, lunch, snacks, and suppers to millions of children every day, presented a clear opportunity. Although we have sold frozen Wild Blueberries to schools before, we haven’t done so in an organized fashion. 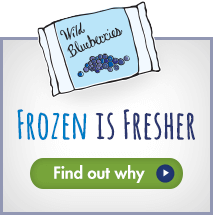 We realized we needed to provide exceptional tools and information to decision makers at the state and school district level so they knew the cost and nutritional advantages of frozen Wild Blueberries, as well as our convenient new packaging and kid-tested recipes. The response to our new program has been amazing, and I think we’re just starting to scratch the surface of how successful this program can be,” said McBrady. The 19 states offering Wild Blueberries through the USDA Commodity Food Program can now order Wild Blueberries in the standard 30-pound bulk case or in a convenient new 24-pound case, which includes eight (8) 3-pound bags. The packaging upgrade accommodates school kitchens by enabling small batch cooking and smoothie making, reducing the need for re-packing, and alleviates pressure on kitchens with limited freezer capacity. Armed with convenient packaging, The Wild Blueberry Commission of Maine began actively targeting states that haven’t yet offered frozen Wild Blueberries to their schools. The effort rolled out in March 2017. The Wild Blueberry Commission of Maine was established to promote the ongoing prosperity of the Maine Wild Blueberry industry. It works on behalf of Maine’s 500+ growers and processers of Wild Blueberries in the areas of research and education, promotion, and policy. For more information visit wildblueberries.com.